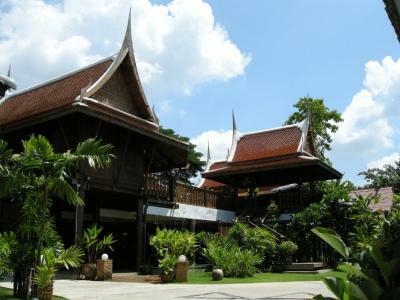 Lock in a great price for Baan Thai House – rated 9.3 by recent guests! Beautiful grounds, great service, wonderful rooms. Was the best around. Great that when we arrived a person was waiting to bring our items to our room. Very friendly atmosphere! The location is located in the middle of greenery. 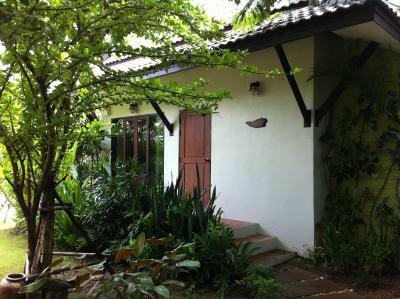 It has a pond, swimming pool and mini gardens where you could saunter around. The staff was friendly and affable. Lovely breakfast, friendly staff, and beautiful grounds. Very quiet area, but close to the main attractions. We really loved the beautiful setting. It was private and very well maintained. 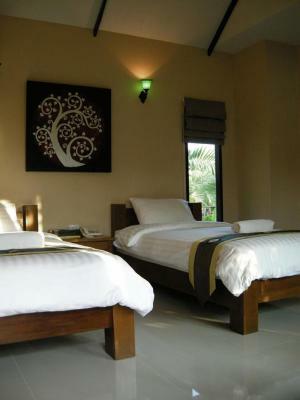 The staff was extremely friendly and helpful and this made our stay so much more enjoyable. The breakfast was good and the room was comfortable and clean. 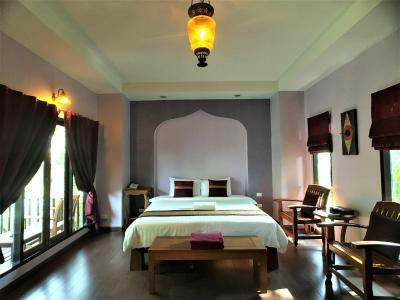 Very nice big room, which is well equiped. 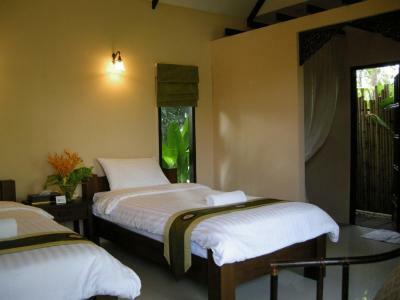 Very nice and comfortable Bed and Bathroom, good view in the very nice Garden Park. Outdoor Park is exceptional, and very nice to see. Very good and helpfull staff. The staff is beyond wonderful and accommodating. It is easy to feel at home here. Staffs have great hospitality. 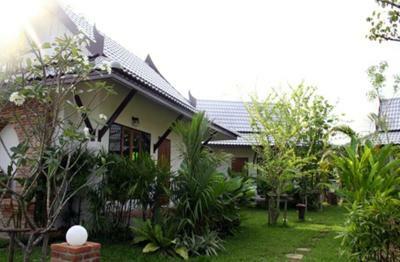 The Comfortable villa surrounded by beautiful garden and small pond made us very relaxing. The Food was also awesome. We enjoyed their boat tour. We’d like to stay again. 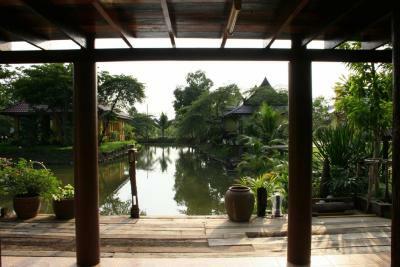 The entire property was very serene and beautiful. 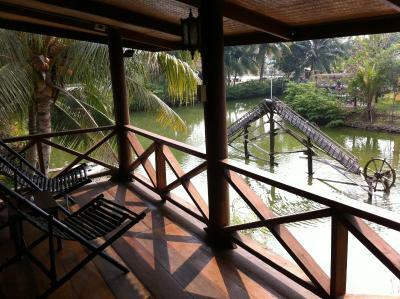 We really liked experiencing the stay in a teak villa right next to the water. It was nice to have the spa right on the property also. The staff were very accommodating and helped us to arrange transportation for wherever we needed to go. It was nice to be so close to the Ayutthaya Unesco Historical World Heritage Site. We were able to take a Tuk tuk from here for a 3 hour tour. 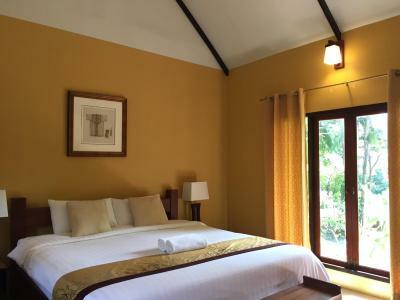 Baan Thai House This rating is a reflection of how the property compares to the industry standard when it comes to price, facilities and services available. It's based on a self-evaluation by the property. Use this rating to help choose your stay! 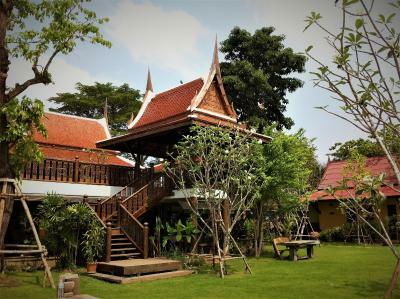 One of our top picks in Phra Nakhon Si Ayutthaya.Baan Thai House offers a relaxing hideaway offering free Wi-Fi and free bike rentals. 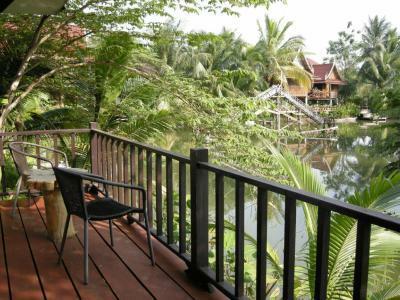 Thai-style villas feature balconies with garden or lake views. A spa is offered in the resort. 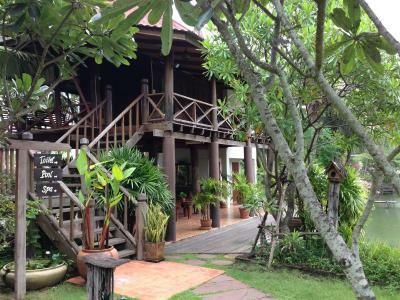 Located in the historic city of Ayutthaya, Baan Thai is just 350 feet from the famous floating market. Suvarnabhumi Airport is a one hour drive away. An outdoor pool is available to take a relaxing swim in, while the resort’s tour desk assists guests in making sightseeing arrangements. 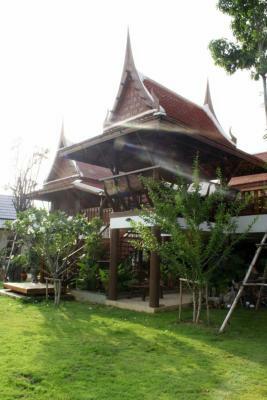 Baan Thai’s restaurant serves a range of local and Western dishes. For a wide variety of drinks, Lobby Bar is available. 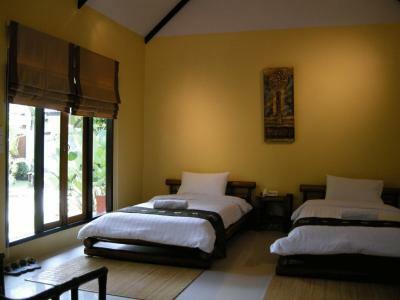 When would you like to stay at Baan Thai House? 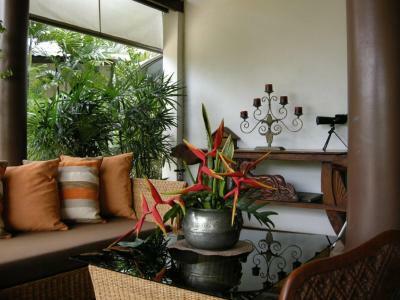 Villa features a balcony with lake views and a seating area. 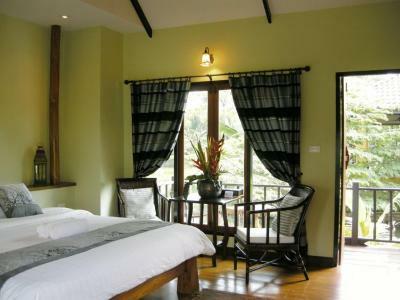 Decorated with wooden furnishing and features a terrace facing the garden, selected rooms come with an outdoor shower. 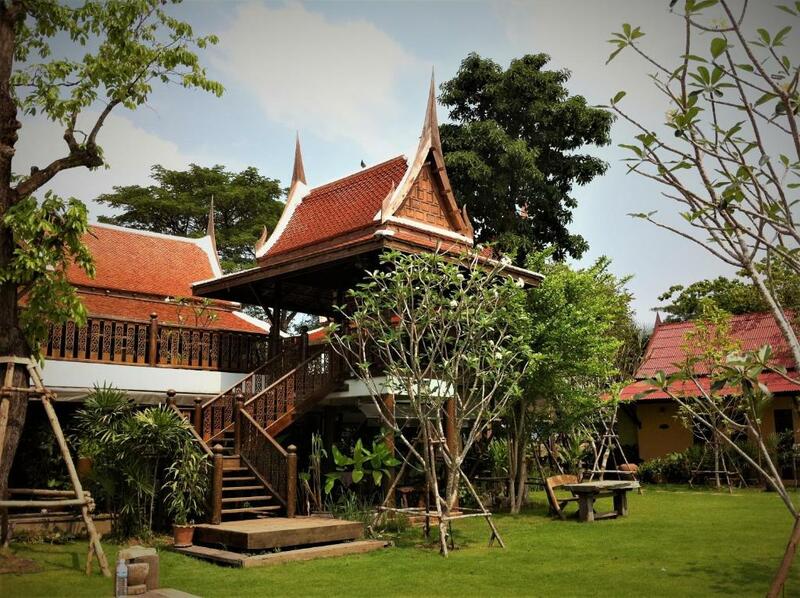 House Rules Baan Thai House takes special requests – add in the next step! Baan Thai House accepts these cards and reserves the right to temporarily hold an amount prior to arrival. All, amazing location and lovely staff! Beautiful quiet space with a fantastic, unobtrusive staff team who were friendly and helpful. 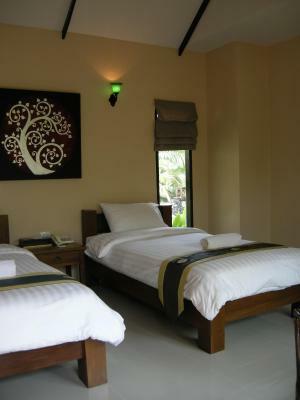 The rooms were amazing - huge, cool, clean and nicely decorated. Pool was great, food fabulous - we had meals as well as breakfast. We would thoroughly recommend this place. Not enough electrical outlets. Too many mosquitoes. Basic breakfast. Garden setting. Nice pool. Comfortable bed. Beautiful balcony with great view. Awesome massage and super nice staff! Good sightseeing and tour trips! Nothing ! I should have stayed longer…. 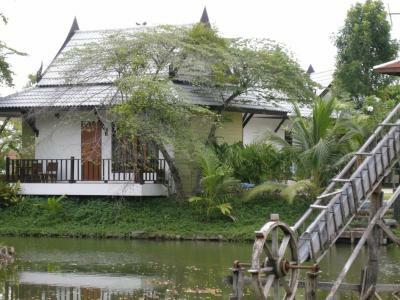 Very nice place to stay 2-3 days to visit Ayutthaya. Wonderfull garden, nice pool. 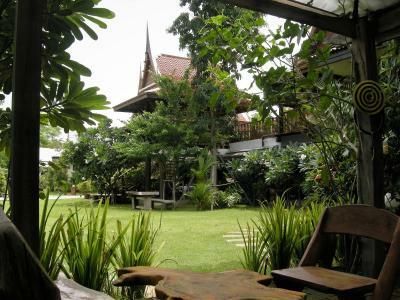 It is a small "hotel" so it is realy relax, the restaurant serves excellent thai food, the staff is very friendly. You can take bikes for free to visit Ayutthaya. I reccomend this place ! 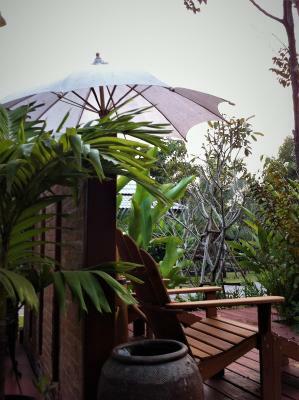 We were so well looked after...it was a quiet haven with lots of plants and water. The pool area was beautiful. 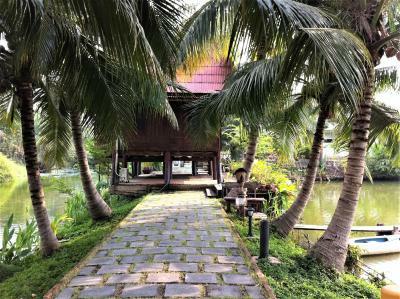 A very calm and peaceful place to stay. The food was excellent. Sadly on the second night (Friday) of our stay there appeared to an event nearby. Unsure if this a regular occurrence. Very loud music, due to the nature of the rooms it sounded like being in a nightclub! I have not scored the hotel down for this but something for other travellers to be aware of. 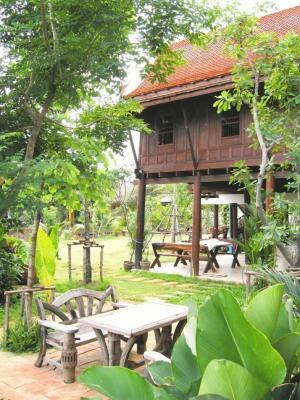 A hidden gem in the most unexpected area of Ayutthaya. 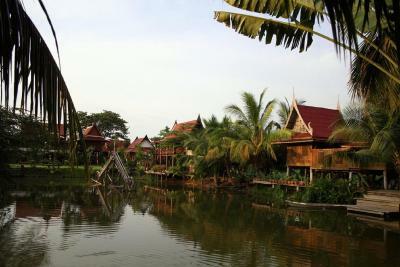 Resort is lovely, set around a central lake. 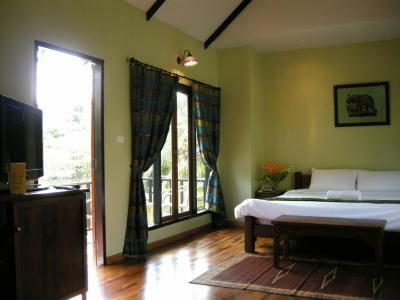 Accommodation is lovely, clean. Prices are reasonable. Food at restaurant of good standard. 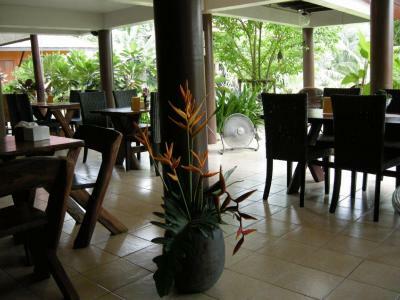 Lovely surroundings, we were very impressed with the friendly helpful staff. Enjoyed swimming in the pool which is surrounded by the beautiful garden & lake. I don’t usually spend this much on accommodation, but it was so worth it! 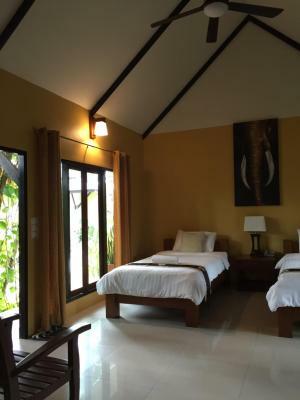 Booked it to stay in the individual Thai House/Villa (they have just the one) and to have a picturesque place to relax, swim and sunbathe for the last couple of days of my trip, once my friends had left and I was on my own. 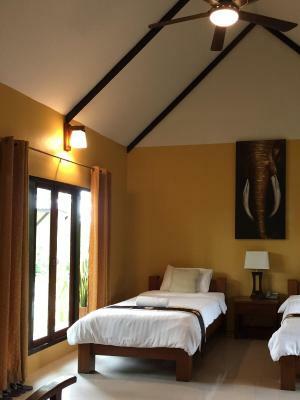 I’ve stayed in an adapted old Thai house before, but this one way exceeded my expectations! 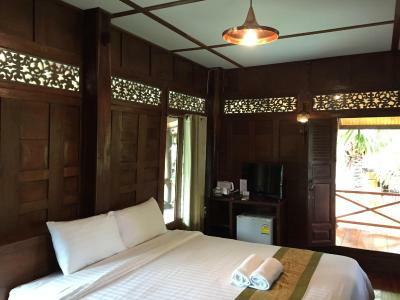 It was beautifully clean, mosquito proofed, well equipped (and with both fan and air con - both super quiet) full of natural light (glass windows one side, mesh windows with shutters to open on the other) and had a wonderful big balcony. Only things I missed at first were a safe and a bedside lamp (which would have made the room brighter in the evenings) - but they weren’t essential. 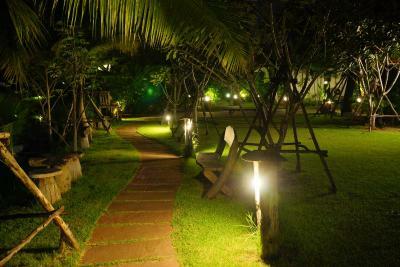 All the facilities are really well designed and maintained, and the grounds are stunningly beautiful. The whole place is peaceful and delightful! Staff are kind, gentle, helpful, friendly, and give a lovely personal service - they made me smile every day : ) Breakfast offering isn’t extensive but enough, and the cakes are homemade. I had lunch there on my last day and they made the meat Penang vegetarian for me - it was delicious. I’d intended to get around by cycling when I booked, but due to recent nerve damage I had to use tuk tuks to get to temples and night markets, and walked 10 minutes to local shops and restaurants in the station area. It’s some years since I’ve been to Ayutthaya and I’m not sure I’d have cycled everywhere anyway - the roads are quite wide and busy in some places now... 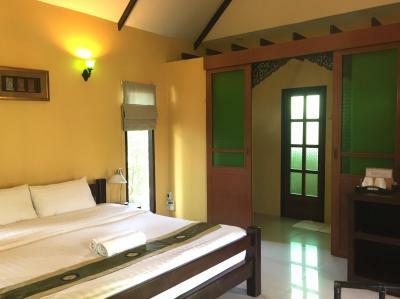 If you can build in some time during your trip to enjoy the gorgeous grounds of this charming guest house, and can stay in the characterful Thai House/Villa, I highly recommend Baan Thai House to you! 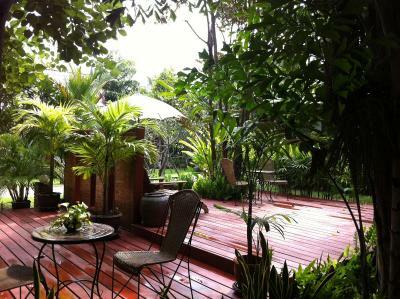 Beautiful garden, super friendly staff, good food, nice room en great atmoshphere. 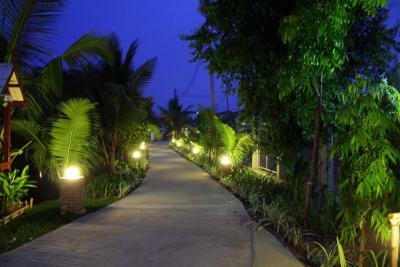 The hotel is good place to start your journey in Thailand. 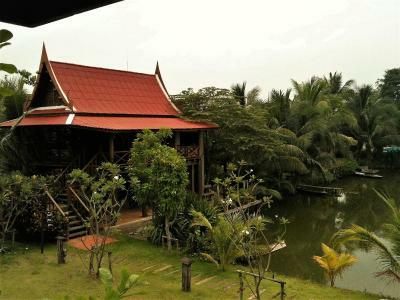 Baan Thai House was a nice place to stay for a night. The staff was nice and helpful. Our kids enjoyed exploring the grounds, riding bicycles and the swimming in the big pool. Hard to access without a car. Wifi was uneven but the staff fixed it by resetting the routers. I didn't like the manner they use with a man owner of a tuk tuk who couldn't enter with me at the hotel... The owner of the hotel wasn't very kind with us because of that. The rest was perfect. Also food and staff.